Peanut butter has always been a love of mine. I actually remember the first time I had it in the US when I was around 11. My day had bought a jar of crunchy peanut butter and allowed me to try some straight from the jar with a spoon. I still remember the stickiness of it as it clung to the top of my mouth. My love for peanut butter since has never wavered just grown. When Dr Zaks contacted me and asked if I’d like to try their new flavoured peanut butter I was very intrigued. I usually stick to just a simple blend but as I have always enjoyed Dr Zaks product I thought they must be good! Plus as I am planning to take on Veganuary I need to stock up on some fab nut butters to keep my protein levels up. The Dr Zaks peanut butters, like all their products, have been designed to cram as much protein in them as possible. For every 20g serving there is 7.5g of protein. Whereas in other peanut butter spread you’ll find around 6g… not a huge amount more but every little counts! In this new range there are 5 flavours; Salted Caramel, White Chocolate & Coconut, Apple & Cinnamon, Cherry Bakewell and Fresh Raspberry. I’ve been giving the Salted Caramel and Apple & Cinnamon one a try and am especially loving the Salted Caramel… I love anything salted caramel. Its got a fab mixture of sweet and salty that is a lovely treat. I’m going to give baking a go with these flavours as think they would work perfectly in protein flapjack or granola bars. I’m yet to try them in overnight oats but think they would be great in these too! 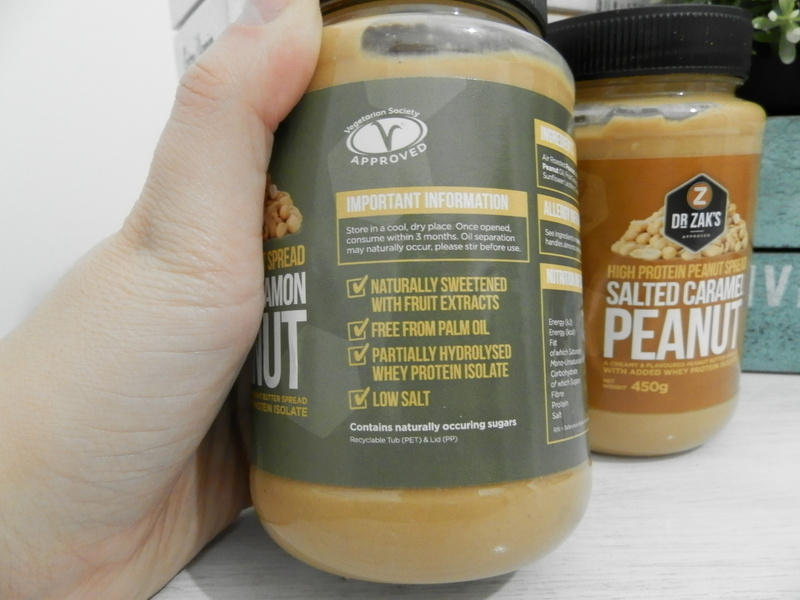 Have you ever tried flavoured nut butters? Which would you recommend? Whaaaaaaaat – these are avaliable in the UK?! Will deffo be checking these out! Salted caramel is one of the best flavours in the world! I need to try this!